Unsightly facial scars may be the result of previous trauma, acne, infection or surgery and are treated in a number of ways. 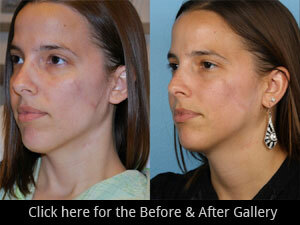 Generally, a scar is unsightly because it does not blend in well with surrounding skin. Pigmentation irregularities, abnormal directions, texture and elevation problems all make a scar more noticeable. In a Scar Revision Procedures, some scars may be removed in their entirety and re-sutured in a controlled and precise manner. Other scars may not be easily removable, but their appearance can be significantly improved through other techniques. In these cases, scars can be made to appear less pigmented, smoother, thinner, and more easily hidden with make-up. Depressions in the skin such as those caused by acne scars can be excised, re-closed, and then later dermabraded to become nearly undetectable. Alternatively, these areas may be filled in with an injectable or implantable filler material (see below). Large scars, contracted scars, or scars that pull structures of the face in an unfavorable way may be treated through techniques that change the position or orientation of the scar. This may result in the scar becoming hidden by the normal structures of the face or falling into normally appearing lines or wrinkles. Dermabrasion and Laser Resurfacing are also good options. There is certainly an art to scar revision. The exact technique used and the success of scar revision depends on many factors—the scar’s size, shape, and location as well as the patient’s age, heredity, and general skin condition. Dr. Sidle has extensive experience with scar revision surgery and tries to help his patients with scars understand all of the possible options so that they can make an informed choice. There is very little discomfort associated with scar revision. All procedures require that direct sun exposure be avoided so that permanent abnormal pigmentation will not occur. The use of sunblocks and avoidance of the sun for at least three months is imperative to avoid pigment discoloration. Collagen Injections can be used to fill out depressed or hollowed-out scars. Collagen is a natural animal protein that blends well with existing skin tissue. Collagen, however, is not permanent and may need periodic re-injections. Other filler options include Ultrasoft®, Restylane®, Sculptra®, Alloderm®, and fat injection.